Season’s greetings from the Rush Archives! 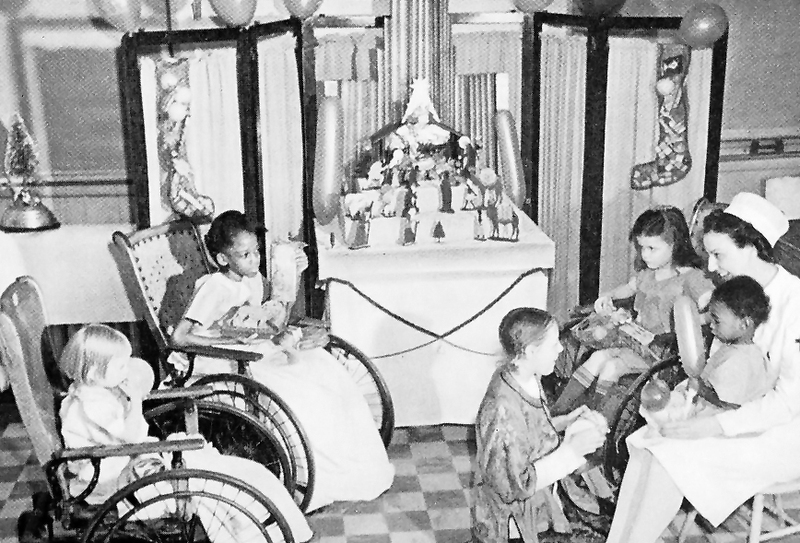 This image from the December 1940 issue of St. Luke’s News shows the hospital’s children’s ward on Christmas morning. Each young patient received a gift hand-chosen by members of the Women’s Auxiliary of the Medical Board of St. Luke’s Hospital. This charitable organization was comprised of the wives of the medical staff. The accompanying article describes the development of the group in 1933 and its various service projects. This newsletter of St. Luke’s Hospital, one of Rush University Medical Center’s predecessors, was published from 1940 until 1956, when St. Luke’s merged with Presbyterian Hospital. Other holiday-themed topics in this issue include Christmas shopping at the patient’s bedside and the bustling hospital kitchen. Nathalie Wheaton is archivist with the Rush Archives. To learn more about the Rush Archives and the history of Rush, please visit the Rush Archives web page. Did you know some of the Rush Archives’ commonly requested books and historic documents are online? To view our current collection of digitized publications, visit our Internet Archive page. This entry was posted in Rush Archives. Bookmark the permalink. ← What’s With the Mustache?